Britain may be a small country, but it is home to a rich profusion of heritage brands that use time-honoured methods of craftsmanship to create beautiful, unique products. While the modern practice of mass-producing homeware in the East has made the latest trends accessible to all, it can never truly emulate the quality, elegance and desirable provenance of British-made goods. This gallery celebrates Period Living’s favourite home-grown manufacturers, from iconic brands with long legacies to new names with a shared ethos. So next time you invest, look no further than our nation’s best design and manufacturing talent. Period Living is the UK's best-selling period homes magazine. Get inspiration, ideas and advice straight to your door every month with a subscription. When decorating a period home, it is important to use colours and patterns that complement the house's age to really flatter its architecture and character. That doesn't mean you have to commit slavishly to an authentic traditional scheme, however. Contemporary designs and colours that have been inspired by designs from the past can work beautifully with an old house, just as authentic traditional decoration can, if applied carefully, suit a contemporary home. Luckily, there are many high quality British decorating brands that cater to homes both old and new. Many of these firms are heritage brands with a long history of creating designs that are perfectly attuned to modern trends as well as the idiosyncrasies of the UK's diverse housing stock. Choosing high quality decorating products from British brands will help ensure your chosen scheme will last for years to come. Below, we list our favourite British decorating brands – including everything from wallpaper, paint, and fabrics for upholstery, curtains and accessories to carpets. Stephen Lewis, a textile printer, and Joanna Wood, an interior designer, formed Lewis & Wood in 1993 in a London basement. Over the years they have created a substantial collection of textiles and wallpapers with a commitment to produce original products designed in their screen-printing studio. In 2008, Lewis & Wood moved to Woodchester Mill in the Stroud Valleys, where they continue to work with weavers, dyers, printers and finishers using new techniques for up-and-coming collections. See more elegant wall design treatments for period-style homes. Tricia Guild founded Designers Guild in 1970 with the philosophy of combining creativity and innovation with the highest levels of quality. The ranges include furnishing fabrics, wallpapers, upholstery, and bed and bath collections that sell worldwide, all in Tricia’s signature style of bold colour and unique design. Back in 1777, Dob Meadows Print Shop in Darwen, Lancashire, opened and still remains Crown’s head office today. During the mid 1800s, it produced wallpaper for brands like Lincrusta and Anaglypta, but by the early 20th century, people’s decorating habits had changed, so the company began to experiment with water-based paints, with its first batch produced in 1906. During the World Wars, products were developed to help with the war effort, including blackout and camouflage paints under the name of Walpamur. By 1949, the company was granted a Royal Warrant, and in 1966 the first range of paints was manufactured and sold under the Crown brand name, which was the beginning of many innovative products that leads us to its fabulous ranges today. Read more about choosing paint for a period home in our guide. William Morris (1834-1896) was arguably the greatest designer of the Arts and Crafts movement. In 1861, he started a decorating business providing beautiful handcrafted products and furnishings for the home motivated by the desire to create affordable ‘art for all’. Over the next 150 years, the company became known as Morris & Co and had mixed fortunes, which led to liquidation in 1940. The stock was bought up by Sanderson and remains part of the design house today, producing stunning prints and collaborations - like the recent H&M campaign. Cole & Son was originally founded in 1875 by John Perry, a son of a Cambridgeshire merchant, in Islington, north London, which was famous for block printing during the 18th and 19th centuries. The company was also known for supplying beautiful stripes and jasper, and revived ‘flocking’ that imitated cut velvet. In 1941, it was bought by AP Cole, who owned Cole & Son Wallpapers, and a few years later the design director created one of the first screen-print studios in Europe. Today, Cole & Son has an extensive archive with new designs still being created that reflect its stunning heritage. With records dating back to 1773, the Little Greene Dye Works of Collyhurst Wood, Manchester, is one of England’s oldest industrial sites for making paints and dyes. The early paints would have had bases of natural resins and pigments, similar to those used by artists of that period. Today, the company incorporates many of the materials used in the past to give its colours high pigment levels – this ensures it is among the market leaders for depth of colour, which makes its shades stand out so well. True to its commitment to conserving traditions of the past, in 2018 it released a stunning new range of 31 ‘greens’ in collaboration with the National Trust. Sanderson is renowned for its beautiful signature style that’s informed by its heritage. The company combines classic, hand-drawn patterns with a fresh colour palette, which makes the wallpaper and fabric designs so popular in family homes. Back in 1860, Arthur Sanderson began importing luxury French wallpapers, and by 1881, built his own wallpaper factory in Chiswick, with three of his sons joining him. He died in 1882, and the company continued to flourish. After WWII, Sanderson bought the design archives and wallpaper stock from Morris & Co, and both companies now sit under the name of Style Library. Mylands was founded 130 years ago yet still remains quite the secret of interior designers and master decorators. Its paints are often used on film and theatre sets, as well as in the most prestigious and stylish homes. Time-honoured techniques have been handed down through four generations of the same family, which has ensured that the quality has remained. Together with superior ingredients and unique recipes, Mylands is the go-to place if you are after a stunning range of 120 timeless paint and wood finishes. Well connected and ahead of her time, Lady Sibyl Colefax began decorating in 1930. Her friends and acquaintances provided her with clients and, during the 1940s, Sibyl invited fellow decorator John Fowler to join her, and so Colefax & Fowler was born. Today, timeless elegance continues to define the company’s English aesthetic, producing fabrics featuring striking prints and embroideries, and decorative and textured wallpapers. In Dorset, 1946, John Farrow, a trained chemist, and Richard Ball, an engineer, met at a local clay pit and shared their passion for making rich colours from original formulations using the finest ingredients. Farrow & Ball built its first factory and supplied paint to Ford Motors, Raleigh Bicycles, the Admiralty and the War Office. At the end of the 1960s they sold their growing business to Norman Chappell but not long after a fire destroyed the factory and they moved to their current home in Wimborne, Dorset. The rest, they say, is history. Use our guide to picking paint colours for every room to ensure you make the right colour choice. Brintons has been manufacturing carpets since 1783, and they are still made in Britain today. The company pioneered the 80 per cent wool/20 per cent nylon yarn blend for carpets in 1950, and in 1958 was granted the Royal Warrant. Collaborations include with Vivienne Westwood in 1993, Manolo Blahnik in 2003 and the latest, with Glasgow-based design studio Timorous Beasties. Brintons is also known for its spectacular advertising campaigns, with models wearing carpet-style designs. Use our guide to choosing a carpet to ensure you invest in quality flooring. If you're after a superior quality item of furniture that has been expertly crafted – perhaps by hand – then look no further than one of Britain's own manufacturers. From makers of stunning upholstered seating to solid wood tables and chairs, we've rounded up the very best. From the humble beginnings of printing small runs of headscarves, napkins, table mats and teatowels on their kitchen table in 1953, Laura and Bernard Ashley grew Laura Ashley into an international household name that is still to this day one of the most loved lifestyle brands in the UK. Clothing and accessories were added in 1960, and there are even Laura Ashley hotels and a tea room, which continue to celebrate the brand’s British heritage. 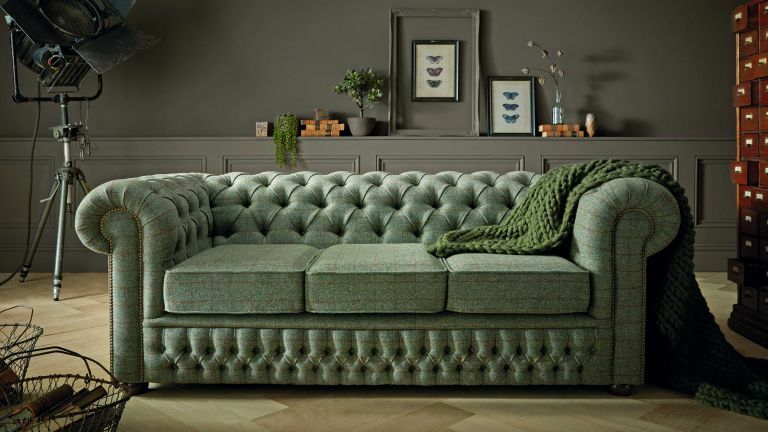 Use our guide to choosing upholstery to ensure you make a quality purchase. Founded in Preston over 50 years ago, Tetrad started manufacturing high-quality traditional and contemporary upholstery in hide. In 1985, it introduced fabric-covered ranges and the company grew rapidly due to its innovative ‘washed’ upholstery. In 2008, it launched a collection of eco-friendly furniture to great acclaim and continued with its innovative designs, teaming up with Harris Tweed in 2013 and then, in 2017, Ralph Lauren. Tetrad has won numerous awards for its exceptional high-quality projects that use traditional craftsmanship combined with modern materials and techniques. Also known as Kirkdale and Thomas Lloyd, Sofa Sofa is a family-run business founded in 1981. It began making leather Chesterfields in the Rhondda Valley, South Wales, and sold them in its shop in Cardiff. The firm expanded quickly and decided to move exclusively to online sales due to the high price of retail space, but put in place a unique 21-day money back guarantee so customers could try sofas in their own homes. Today, there’s a showroom in Crumlin and the business remains true to its ethos of providing great quality furniture, all made in the UK. Established in 2013 by Sarah Massouh, Willow & Hall offers beautiful handmade furniture that’s crafted in Wiltshire by master craftsmen with over 35 years’ experience and deep knowledge of upholstery skills. The philosophy that Sarah lives by is to design British furniture to a high quality, and to offer customers fantastic value and personal service. The Wrought Iron & Brass Bed Co is a family-run business that handcrafts beds on the Royal Estate of Sandringham. Started after the owner felt underwhelmed about the lack of lovely beds, the company began with two designs, Sophie and Emily, and steadily grew, with both sons now involved in the business. Today, there is a large range to choose from including traditional designs in iron, brass and nickel, and industrial chic styles. Titchmarsh & Goodwin is a family-run business with roots as far back as the 18th century, when Samuel Goodwin send his son George to join the workshops of a London cabinetmaker. When he returned, he set up his own workshop in Ipswich, and in 1920 his descendant Gordon Goodwin founded the company with Lawrence Titchmarsh. In 1924, with business booming, the company bought its current premises in Back Hamlet. Even now, furniture is being made in a similar way to the time of George Goodwin, using handcrafted skills. It supplies the finest homes around the world, and you can visit the workshop to see your furniture being made. James Marshall, an English engineer at the turn of the 20th century, designed a mattress that had individual pocketed steel springs wrapped in bleached muslin, quilted with horsehair and outer tufted. John Nolon and Frederick James decided to promote his mattress, but after no interest produced it themselves, and the Marshall Sanitary Mattress Company was formed in 1901. In 1911, it was renamed Vispring and the bespoke comfort threw the brand into the world of luxury, even fitting out the Titanic with its mattresses. In 2012, Vispring was awarded the Queen’s Award for Enterprise and today still supplies legendary vessels as well as 55 countries. Use our guide to ensure you buy the best bed. Founded in Britain in 1920 by Lucian Ercolani, a young Italian whose goal it was to make furniture that was well designed, by skilled craftsmen who had a passion for what they were doing, Ercol maintains this philosophy to this day. The company is known for its beautiful, mid-century modern designs that are expertly crafted. A family business that started life back in 1982, Sofas by Saxon produces sofas and chair frames made from solid beech hardwood using traditional joints, strengthened corners and sturdy suspension. Each button and stud is hand-tacked by one of its skilled craftsmen, and its leather is sourced from the best Italian tanners. It uses sumptuous wools, tweeds and linens that are all woven and finished in Britain. Use our guide to choose the best sofa and armchairs for your period home. Batheaston is renowned for its ‘made to measure, made to last’ ethos. Established in 1955, it has remained a family-run business for three generations, creating beautiful pieces using traditional methods from its workshop in Yorkshire. Each furniture design is produced from solid natural wood, including oak and ash, taken from trees sourced from sustainable woodlands. Use our guide to ensure you choose the best dining room furniture. Frederick Parker created his cabinetry business in 1869 when he was only 24. As the business grew, he supplied Victorian gentry and leading London retail companies with furniture, eventually opening a London store in 1875. Frederick’s philosophy was to design the finest furniture using the best British craftsmanship, skills which he learned from his father, a cabinetmaker, and that he in turn passed on to his sons. During the early 1900s he moved the business to High Wycombe, and was asked to furnish the Palladian Lounge on RMS Aquitania. With his sons developing the business, in the late 1920s they met Willi Knoll, who developed the revolutionary coiled steel wire spring for Parker Knoll seating that remains unchanged today. Use our guide to choose the best living room furniture. Marks & Spencer was formed in 1884 when Michael Marks, a Polish refugee opened a market stall in Leeds, with the slogan ‘don’t ask the price, it’s a penny’. In 1894, he went into partnership with Thomas Spencer, a former cashier from the wholesale company, Dewhirst, and in 1904, Marks & Spencer's first shop opened in a covered arcade in Leeds. The flagship Marble Arch store opened in 1930, with food introduced the following year. Online shopping was introduced in 1999. Known primarily for clothing, Marks & Spencer produces a strong range of quality furniture and accessories. If you're updating your bathroom, you will discover a huge range on offer, and it can be difficult to know where to begin. So why not start with one of the UK's quality brands? From makers of luxurious traditional roll-top baths to handmade wall and floor tiles, we've got you covered. Find out more traditional bathroom design ideas in our gallery. Back in 1994, Albion’s founders decided to create the ultimate bathtub. They didn’t want to use acrylic, and cast iron has drawbacks (in particular its weight), so after two years’ development a new material called Iso-Enamel was created. The company has gone from strength to strength and now manufactures freestanding baths in its innovative material that mimics cast iron yet is around a third of the weight. See more traditional roll-top baths in our design gallery. Drummond Shaw founded Drummonds in 1988 when he was restoring his period house and found it difficult to source authentic pieces. The company quickly became established as the best architectural antiques dealer in the UK. Classic bathrooms remain the core of the company, and its passion lies with finding original pieces that can be restored and fitted with modern plumbing systems that suit homes today. See more statement freestanding baths in our design gallery. Thomas Crapper started his eponymous plumbing and sanitary engineering business in 1861, and quickly became known for his excellent work. Realising there was a market for high-quality toilets and bathrooms, he opened the first ever bathroom showroom in 1870. Awarded several Royal Warrants for its products, Thomas Crapper is today renowned for using the best quality materials, combined with traditional manufacturing techniques, while also embracing modern technology. Charles Percival Hart, a south London builder, established CP Hart in 1937 with his two sons to supply the trade business. With an unrivalled reputation for service and expertise, he opened five London stores, offering exclusive items that no one else was selling. This continues today, and the company has an experienced and highly trained design and sales team that offers technical expertise to help you plan every aspect of your bathroom project. The origins of Marlborough Tiles can be traced back to the early 1930s when two schoolteachers, Sylvia Packard and Rosalind Ord, found that their mutual interest in painting ceramic tiles was commercial enough to provide them with a living. In April 1936, the Packard and Ord partnership was officially registered and the business relocated from Bath to Barnfield, Marlborough. They initially specialised in commissions and giftware, with much work coming via word of mouth, and customers ranging from royalty to public houses. Queen Mary was a regular customer and they even supplied tiles to Fortnum and Mason. Their hand painted work was hallmarked 'PO' (Packard & Ord) on the front of the tile and examples can still be found today in the V&A Museum, private collections and, of course, on walls across the world. They continued to work on commissions until the war forced them to stop in 1940. Find the right sized tiles for your small bathroom in our guide. For most people, redesigning the kitchen is the most important project in the home. Investing in solid-wood British made cabinetry will add value to your property, while making it a beautiful, practical space that makes use of every inch and encourages the family to spend time there together. For a kitchen that really flies the British flag, look beyond the units themselves to appliances such as range cookers made by heritage manufacturers. Situated in Tideswell, Derbyshire, Churchwood Design is a family-run kitchen and furniture manufacturer that has stood the test of time over the last 30 years. The second generation of the Ambler family are now involved, and offer stunning bespoke kitchens and beautiful cabinetry crafted from natural timbers and finished by hand. Thomas & Thomas founders Howard and Robert’s design philosophy stems from an understanding of the role of the kitchen and home within modern family life. Practical, yet sympathetic touches sit side by side with furniture made and fitted by expert cabinetmakers in England. Browse these boot room design ideas to inspire your scheme. In 1975, Martin Moore, a design engineer, and his wife moved into an old Victorian house that needed renovating. Martin designed and made the furniture to suit their needs, and before long the couple had turned their passion for crafting handmade kitchens into a thriving business that offers stunning bespoke designs, perfectly suited to period properties. An essential for every traditional-style kitchen, the first Aga was created in 1922 by blind Nobel Prize winner Dr Gustaf Dalen, who had invented the world’s first heat storage cooker. Manufacturing got underway in Smethwick in 1929, and during the war years of the 1940s, Agas became life-savers, with the British Government placing orders for them to put in canteens, feeding centres and hospitals. The popularity of these now iconic cookers grew over the next few decades, and in 2004, the electric model was launched; now half of all Agas sold are electric. Today there’s a model for everyone, and for every sized home. See more range cookers in our buyer's guide, and use our guide to choosing a range cooker to find the right model for your period home. Heating a period home is delicate balance between providing new efficient solutions while not disrupting the fabric of the original building, and impacting on its 'breathability'. There are a number of high quality European manufacturers of stoves and fires, but for classic British style, look at one of the key home-grown firms. No living room is complete without a warming focal point, and stoves continue to rise in popularity for their looks and functionality. Founded in 1972, by Alfred J Wells and 2 of his sons when Dutch elm disease hit the country coinciding with the oil crisis of the seventies. The trio came up with the idea of making a small stove which could fit into a typical British fireplace. Charnwood Stovesis reputedly Britain’s oldest stove manufacturer and Over the years have developed clean burning and as efficient stoves to simplify the burning process for today's modern lifestyles. Use our guide to choosing a stove to make the right choice for your home, and browse our pick of the best stoves to buy. Established over 30 years ago, Chesneys is a leading luxury brand when it comes to fireplaces and accessories. The company initially only restored antique fireplaces, but from the early 1990s began reproducing fireplaces in both classical and contemporary designs, as well as offering a bespoke service. Established in 1986, Charlton & Jenrick is behind a number of leading brands, covering all aspects of the fireplace industry. The company designs gas, electric and multi-fuel fires and stoves that are handmade in its factory in Telford, Shropshire, supplying to over 400 showrooms throughout the UK. If you're planning to update windows and doors or add a conservatory or sunroom, or an orangery, then it's important to invest in quality designs from a company that understands the intricacies of British architecture. Here are our favourites. Based in Grantham, Vale Garden Houses is a family-run business that was founded over 35 years ago. It is now one of the most respected and established conservatory companies in the UK. Two generations of the family still work daily on the designing and manufacturing of its bespoke conservatories and orangeries. Established in 1920, Scotts of Thrapston is still a family-run business. Renowned for its high-quality timber products including summerhouses, doors and windows, and bespoke joinery, Scotts perfectly mixes modern technology with traditional craftsmanship to ensure a beautiful product that blends with a period home yet meets modern design requirements. For the last 25 years, The Sash Window Workshop has been manufacturing, installing and repairing timber windows and doors in period properties. It started operating from a pig shed in Ascot and now employs over 80 people. All new joinery is made in house and potential customers are welcome to have a tour of the workshops. Founded in the 1980s, David Salisbury has been manufacturing precision-made wood and glass house extensions for over 30 years. With a team of specialist designers offering a bespoke service, and skilled craftspeople, the company ensures each design perfectly fits around your family and lifestyle. In 1980, Border Oak began to pioneer the revival of green oak framing across the UK and worldwide. The family-run business has an experienced and skilled staff of more than 120, and aims to design and construct the finest oak frames possible. Each building is bespoke and designed to reflect the client’s building, budget and aspirations. See our ultimate guide to planning and designing a kitchen to ensure you get the best result from your room transformation. Updating your lighting scheme is the perfect opportunity to invest in one of the brilliant British-made designs on offer. We've rounded up the best home-grown manufacturers. Back in 1993, Jim Lawrence began making candlesticks for friends in the farm forge. They loved them, and he soon realised that there was a demand for stylish designer products crafted from natural materials. Today, the company employs 130 engineers, welders, painters, seamstresses, electrical technicians, lampshade makers to name but a few and, now based in Hadleigh, Suffolk, it’s still a family-run business that employs up to three generations of local families. Find out how to plan living room lighting to perfection with our guide. In 1932, automotive engineer George Carwardine developed a formula for a new type of spring. This became the blueprint for an Anglepoise – a four-spring lamp that allowed you to adjust it to suit your needs. The demand was unprecedented so he sought the help of Herbert Terry & Sons, who supplied the springs. Not long after, the name ‘Anglepoise’ was registered and the company was born. Decades later, and following collaborations with the likes of Paul Smith and Margaret Howell, the Anglepoise remains one of the most stylish lamps on the market. See more stylish living room lighting ideas in our guide. There are so many different companies on the British high street, making choosing pieces for your home an overwhelming experience. Narrow down the search to UK designers and manufacturers to ensure you are investing in quality items that are ethically produced. We're rounded up some of our favourites. In 1837 Bronte by Moon was founded by Abraham Moon in Guiseley, West Yorkshire. Thirty years later, he had a three-storey mill built, which housed town dyers, spinners and weavers together under one roof for the first time. Sadly, Moon died in 1877 in a horse-drawn carriage accident and his son, Isaac, took over. After surviving a fire and having to build a new mill, the company started to supply the British Army during WWI. Decades later, and with Abraham’s family still involved generations down the line but with new owners, the Walsh family, a furnishing collection was launched in 2003. Since then, the company has gone from strength to strength with a flagship store opening in York in 2017, and 180 years after being founded it is still an innovator in design. Founded in the UK nearly three decades ago by Tom Joule, lifestyle brand Joules has an expanding homeware collection that sits perfectly with the heritage and authenticity of Britishness, family values and quality. Each design is lovingly hand-drawn by the in-house team, and represents the company’s ‘contemporary country-loving’ ethos, where inspiration is taken from nature and the ever-changing British seasons. Back in 1985, Emma Bridgewater tried, and failed, to find a nice birthday present for her mother; she was after two cups and saucers that said, ‘I love you. I miss you’. From there, her pottery brand was born, and over the last three decades Emma has designed beautiful and recognisable pieces that adorn many homes in the UK. With each print thoughtfully designed, now you can buy not only mugs, but tins, stationery, wallpaper and fabrics. Owned by the same family since 1912, Melin Tregwynt employs over 30 people at its small, whitewashed woollen mill in Pembrokeshire, making beautiful wool blankets, cushions and throws. The company also offers upholstered items, accessories and bags – all made in its stunning signature fabrics. In 1850, Henry Christy returned to England from Constantinople with a sample of loop file fabric, which hadn’t yet been seen in the Western world. Alongside his inventor brother, he created a machine that enabled terry towelling to be produced on a large scale, here in the UK. A year later, the first terry towel was produced and shown at the Great Exhibition of 1851. When Queen Victoria was presented with a set, she immediately ordered more, and that was the start of the company. Every year, Christy designs and produces the Wimbledon towels, which continue to be an iconic sight. Try these neat towel storage ideas to keep your bathroom tidy. Based in Stoke-on-Trent, the heart of English pottery, Burleigh is a British brand that uses the same time-honoured manufacturing process employed since 1889. There are now only 11 craftspeople in the world that have the precise skills needed to carry on Burleigh’s decorative lineage, and it’s the only pottery that decorates using tissue transfer printing. Recent collaborations with other renowned British brands include Soho House, Harrods and Fortnum & Mason. Twenty-four years ago, Chrissie Rucker had a vision to create a company that specialised in white homeware made from the highest quality materials. Today, The White Company continues this vision selling super-soft cashmere, crisp white sheets, textured cushions and much more. See more pretty bedlinen ideas in our guide.